The Gāyatrī Mantra is a highly revered mantra from the Vedas. Like all Vedic mantras, the Gayatri mantra is considered not to have an author, and like all other Vedic mantras, is believed to have been revealed to a brahmarshi, in this case Vishvamitra. Gayatri is said to be the power that can destroy and overcome all sins and sorrows, and the chanting of which helps us overcome adversity. Gayatri proclaims the fundamental doctrine of Vedas that a man can get realization of God in his life with his own efforts without the intervention of any prophet or Avtar. Reciting this mantra one becomes intelligent. 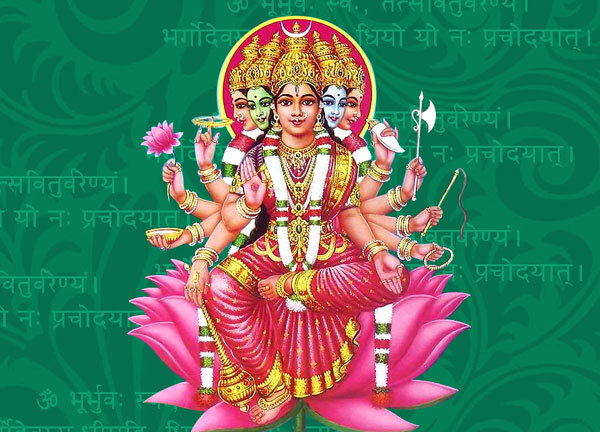 Gayatri is the mother of Vedas and all knowledge. By reciting this Mantra one gets rid of all types of sins. One becomes energetic. It brings Siddhis. According to Lord Buddha it is a small Mantra but has unlimited powers in it. Chant this mantra 108 times daily on a rosary of Rudraksha beads. For chanting Gayatri Mantra the best time is time of sun rise and before sun set. Hindu Brahmins wear Dhoti and Yagyopaveet and only one wearing Yagyopaveet has the right to chant Gayatri Mantra. This chanting of Gayatri Mantra is known as Sandhya Karma and Sandhya Karma is done by all Brahmins since ancient times. As per Chanakaya also Sandhya Karma is the root Of Brahmin. After Sandhya, 24 Mudras of Gayatri are exhibited and finally Arghya is offered to Sun. It is followed by Guru Vandana and Ganapati Pujnam.